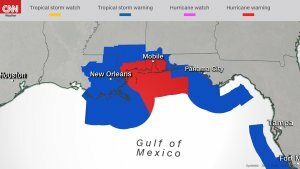 (CNN) — Tropical Storm Gordon is expected to smack the Gulf Coast on Tuesday night — possibly as a hurricane — and could bring life-threatening storm surge to low-lying coastal areas in Louisiana, Mississippi and Alabama, forecasters said. 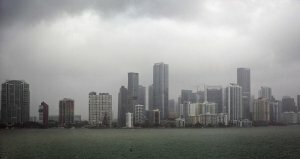 After marching up from the Florida Keys and lashing South Florida on Monday with rain, Gordon was centered Tuesday morning over the Gulf of Mexico, about 190 miles east-southeast of the Mississippi River’s mouth, with maximum sustained winds of 65 mph. 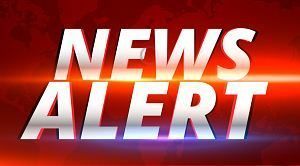 The NHC’s hurricane warning for Tropical Storm Gordon covers all of coastal Mississippi and Alabama, with a tropical storm warning reaching to Morgan City, Alabama, and Florida’s Okaloosa-Walton County Line. A hurricane warning was in effect Tuesday morning for all of coastal Mississippi and Alabama, with a tropical storm warning reaching to Morgan City, Louisiana, and Florida’s Okaloosa-Walton county line.